Carrying out a systematic analysis of our context is an activity which underpins our ability to design and maintain updated and accurate security strategies. This because, naturally, as we and the context in which we are living and working change, so too does our security situation. The threats we face are constantly changing and our security strategy will only be effective if we acknowledge that fact and plan accordingly. If we take security precautions just our of habit or based on hear-say, we may find that changing circumstances render them ineffective. Below is an overview of the different ways in which we can increase our awareness of our changing context, develop strategies to achieve our goals and simultaneously avoid, reduce and mitigate threats which may arise. Many of these steps may already be familiar and you may well practice them already: however it helps to be systematic about this if possible. In the following chapters we will look at each step in depth, in an order moving from the general to the specific. However, the order in which you use these tools in practice will of course depend on your own working and planning processes. Situation monitoring and analysis: observing the overall trends (political, economic, social, technological, legal or environmental) which are relevant to our work and taking note of any developments relative to our security. Establishing our vision and activities: based on the above, we can reflect on the problems we have identified, the change we envision in our society and what strategies we use to achieve that change. Actors and relational mapping: creating and maintaining an inventory of all the people, groups and institutions who will be or may be affected by our action, including ourselves, our allies and opponents. This later helps inform our advocacy strategies in order to maintain our space for work. Information mapping: taking account of our personal and professional information, and making sure it is safe from being lost, damaged, or falling into the wrong hands. Security indicators: taking note of occurrences which are out of the ordinary and which may indicate a change in your security situation. Over time, analysing any trends in these which may impact your security strategy. Threat identification and analysis: having carried out all of the above, identifying potentially harmful events or actions of others which you feel are likely enough or potentially harmful enough to prepare for. We analyse these threats in terms of who is behind them, the resources available to reduce their probability or impact, and what next steps to take. Security planning and tactics: based on this analysis, you can identify and take concrete measures to improve your security. This step is explored in more detail in Section III. While in this manual we will follow this process once, these tools are of course to be used iteratively in accordance with your own planning processes in order to remain updated. The process outlined above is designed to help us be as objective or scientific as possible in diagnosing our security situation. However, security remains fundamentally a question of our perception. In Section I we have entered into some detail about the challenges and opportunities presented by our 'subjective' experience of security. 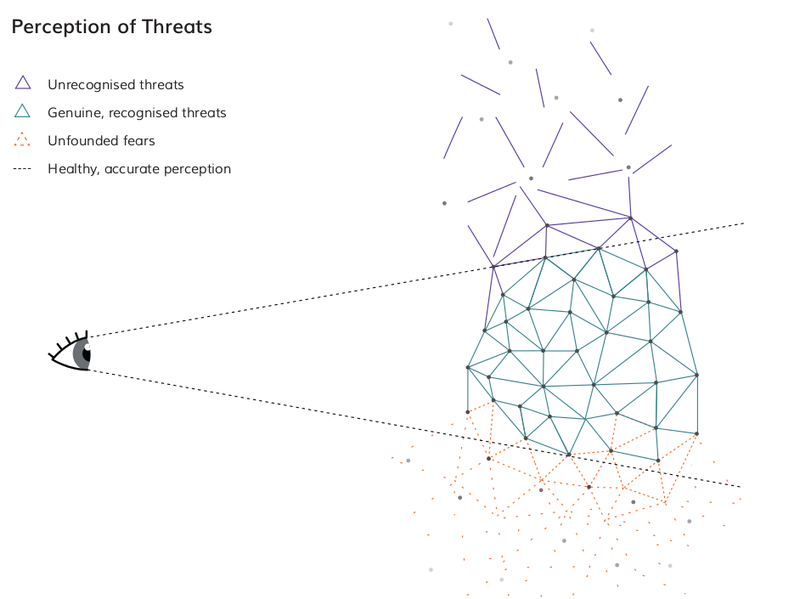 Our perception of threats may be challenged, limited or flawed: we may have unrecognised threats -- which we are unable to identify due to an unfamiliar environment or because our opponents are successful in concealing them, such as electronic surveillance – or unfounded fears – things that pose no actual danger to us but which we identify as threats due to misinformation from our opponents or from our own anxious emotional reactions, possibly related to past traumatic experiences. To read more on this, refer back to Chapter 1.2 Individual Responses to Threat. It is possible, though still challenging, to get a realistic idea of the level of threat we face if we keep all these factors in mind. The challenge we face is reducing the number of unrecognised threats and unfounded fears so that our security practices are as effective as possible. We can improve the accuracy of our perception by undertaking research and analysis, and by checking our perceptions with trusted friends or colleagues. Read on to find out more.